due to item's weight and shipping cost, only local purchase please. we may deliver. OK. 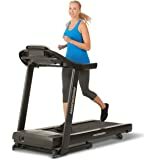 So people said this treadmill is great...just about every fitness website also condones this treadmill as the best all around bang-for-the-buck treadmill. So, we tried it out. We purchased this on 1-14-14, it was delivered 1-22-14, and it has now sat in our living room for several weeks; now 2-19-14 as of writing this and still DOA. Numerous parts were damaged, but the box that it came in was in almost perfect condition. We contacted Horizon to see if they would make things right, as other reviewers mentioned- various plastic pieces were broken, replaced no problem. OK, that's great. So, it turns out we needed 11-parts and various fasteners just from what I could detect was damaged. I asked them, at what point do you guys replace the whole unit, they said we generally don't. They assured me though, that they would send all the parts necessary and send out a technician to put it together and test it. Half the parts were back-ordered and took additional time to get here, thus the one-month time of no treadmill. They did send me a mat for all the pain and suffering thus far- decent response and accounts for the one star, but at this point I am still feeling uncompensated. The technician just left. He started to remove the damaged plastic covers and notices something and says "uh oh"...he found a loose plastic cover, which revealed that the frame was damaged on top of one of the feet, or stabilizers as he called it. 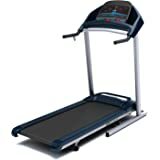 I asked him, have you ever seen a brand new treadmill in such a state, he glared and said never. He said that after seeing the bent frame in congress with the damaged pieces, that he would suggest a replacement unit. Luckily, I still have the box, and he was amazed that the box looked great. He believes that the damage to the frame was probably done by a forklift-fork, and was probably done before it was packaged and shipped. This tells me that Horizon is perhaps not as great on quality control as people may believe...then again, perhaps this is a one in 10,000 mistake. Pictures have been sent to Horizon, and I still have not heard back from them in any way, shape, or form...you think they would at least contact me and apologize or console. Now I am out of my return window from Amazon and feeling pretty upset by all of this. I have no idea what Horizon plans to do, but I hope it is phenomenal, as right now I am pretty upset and the company name is leaving a bad taste in my mouth. I may edit this if they fix everything in some super way, but at this point, I just want to strongly encourage everyone, that if you receive one of these, make sure you check EVERYTHING. Get out a bright flashlight and your camera, and look this thing over from stem to stern. 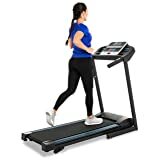 If the frame is damaged at all, it could cause the balancing aspect of the treadmill to weaken quicker than it would normally, thus lowering the life of the treadmill. So, good luck to anyone purchasing this, hopefully you get a gem. I hope this helps. Not sure if they saw the review or not, but I was just contacted by Horizon. They said, yes that they would OK a replacement unit, but it is back-ordered and would not get to their warehouse until mid-March. I said that is ridiculous. Can you do anything to compensate me for all this time of it sitting dead in our living room and all the time I will have to wait for a new one? She replied that they could not offer me any money...I said I did not want money, but something to show that Horizon cares. She said she could send me three bottles of lubrication and a mat. I said I already have a mat, is that it? She said yes. I asked to speak to a supervisor, she repeated herself, I asked again, she repeated herself and added he will say the same thing. I stated that I was getting upset, and that I wanted a supervisor, she said what is the nature of your question, I said I am getting upset and you are repeating yourself, I want to make sure this is how Horizon does business. She puts me on hold, comes back and says, well, we can send you out the next model up-I cannot remember her exact wording, but something along those lines. I asked her to hold on while I looked at it. It appears to be the same thing and size, just a few more options, so it would fit our space. I asked her if it was in stock, and she said yes. So, she placed the order and said she would also send me those three bottles of lubrication too. I thanked her and asked her pardon if I sounded upset, but that this whole ordeal is frustrating to go through, she said it's OK and understandable. I have not received any emails confirming this order yet, so we will see. I will update if and when Horizon makes things right. 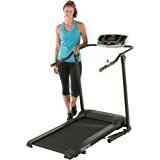 Ok, I have probably been using the new treadmill for a week or so as of this post, and it is great...now that it is as it should be. Making a long story short, Horizon did in fact send me the next model up, the T202, which is great, but also arrived damaged. However, only minor damages- the top motor cover and left-side deck rail. At this point, Horizon did not need pictures, as I guess they assumed I was becoming an expert at their devices and just sent me the parts and associated decals. I received them about a week after I received my treadmill. Today, the treadmill looks great and operates great. Even though it was a bit of work on my part in working with Horizon, they did come through in the end. If you get the T101 or T202 and they come with only minor damage, just go through warranty services and you will be OK. If more than two parts are damaged, send it back to Amazon and save the hassle. I would give this unit five stars easily if my original arrived without damage or only minor damage, as the device is phenomenal and warranty service is decent to good. However, with everything I have gone through, I can only give it four stars, as your device may arrive with damage. That said, no matter what is damaged warranty service will fix it, but be prepared for long wait times for new parts, as the T101 is extremely popular and they are back ordered on almost every part. 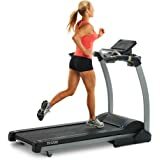 Good luck, and if you get one with no damage, consider yourself a winner and enjoy a great treadmill! I have downgraded the review to 4 stars. I've put 185 miles on the machine (I keep track by miles instead of hours) and it doesnt seem as quiet as when it was first assembled. This doesnt really bother me as I keep it and run on it in the garage but it's not "whisper" quiet as advertised. I've performed basic maintenance per the manual but it did not affect the noise. Also, about a month ago I had some problems with the "on" button on the terminal. It would require a much more forceful press than the other buttons. Strangely this problem went away after about a week. I did contact Horizon and they also provided some troubleshooting tips. But I would still buy the treadmill instead of a $999 one. 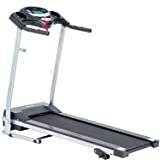 Probably like many of you I was very concerned with purchasing a new treadmill. There are negative reviews for every brand and model at each price point. I didnt want to spend more than was necessary but also didnt want to purchase a product that would not last. 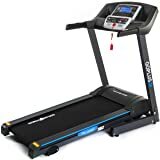 I just received and set up the treadmill so I'm not able to judge the reliability but will revisit the review if necessary. I'm 5'11" 165lb male. 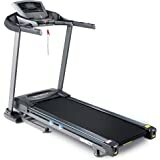 My previous treadmill only had a 55" running surface and I think that is enough for almost anyone. If it's not maybe you're overstriding but that's a different issue. I generally run about 25-30 miles a week, about 10 miles on the treadmill. 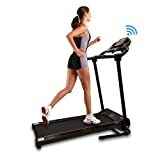 I did not want to pay for a treadmill that could go to 12% incline or 12 mph because I run around 6.5 mph at .5 or 1% incline. Above this price point you get a bigger motor, which may help durability, a larger running deck (which I didnt need), and then additional electronic features that I wasnt interested in. Delivery went very well. The shipping company called me a week after I placed the order and we set up a date with a four hour window for the actual delivery. The driver called about 30 minutes prior to arriving. He had the treadmill on a pallet and wheeled it to my garage. I did not pay for assembly or extra delivery so I dont think he would have brought it inside the house. Assembly was very easy. The treadmill comes in four pieces. The deck, two arms, and control panel. If you've every put together boxed furniture you can assembly this. I think it does require two people for some sections to help keep it aligned while you screw it together. It probably took 40 minutes. I did need to adjust and tighten the belt but this is very easy to do. My first run was fine. The treadmill is quiet, and everything worked without any setup on the panel. My ipod played directly through the speakers with the included cord. I'm very pleased with this treadmill. 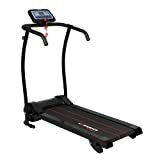 I think it matches up well with the $999 treadmills. I've had this treadmill 3.5 years now. Up until the last few months, it has worked flawlessly. I started to notice a sag and found that the deck is now cracked. 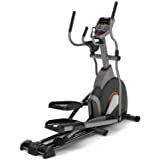 I talked with Horizon Fitness, and although the motor and frame have lifetime warranties the deck is only covered for one year. Horizon wants $140 plus shipping for the deck. Although clearly within their rights, I expected much more from this treadmill. I kept the treadmill clean and lubricated the belt on schedule using the recommended silicone that Horizon called for. 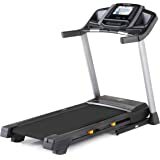 It has been in the same place all this time so it's not as if moving the treadmill caused any issue, and it's in a climate-controlled space so temperature and humidity should not cause undue stress to the deck material. 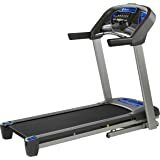 I am about 145 pounds and run on the treadmill an average of 15 miles per week, so it gets regular use but in my opinion I'm not putting a significant load on the deck. I'm not satisfied with the fact that I need to spend an additional $140+ to repair this myself for what should have been a durable, long-lasting piece of equipment. I've put less than 3,000 miles on this treadmill and expected much more from it when I spent $630 originally. 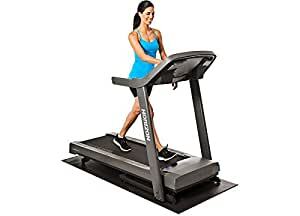 I owned an old Image treadmill that I purchased from WalMart for twice this long and the only reason I got rid of it was that the belt finally stretched beyond where it could be tightened. By that age, I felt like it was better to just get a new one because of the age of the motor and electronics. I hoped for much longer service from the T101.